The LG V20 may be the most popular device to be already running Android Nougat, but it certainly isn’t the only one. Android in the upcoming weeks if not sooner. 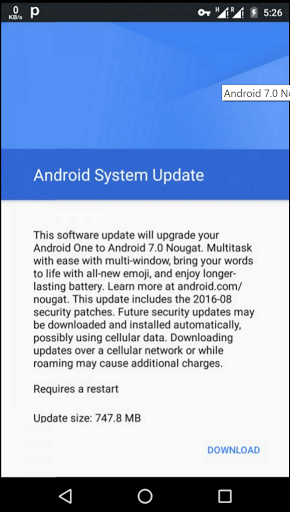 750MB, available as an OTA update. for the latest Nougat update to head your way. It seems Google is keeping to its promise for devices running Android One Devices which is that the devices will receive automatic Android updates for up to 2 years.